Many people enjoy solving puzzles such as crosswords, sudoku and kakuro. Internet web sites for puzzle fans include sites with tutorials on how to solve various types of puzzles, as well as software tools for creating your own customized puzzles. 120 Printable Sudoku Puzzles For Children. Want to learn more about Sudoku For Kids? Want to learn more about The Ultimate Sudoku Guide? 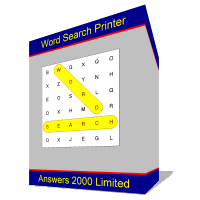 Want to learn more about Word Search Printer? If you have anything you would like to say about any of these puzzles products, please leave a comment either on this page, or on the individual product's review page.